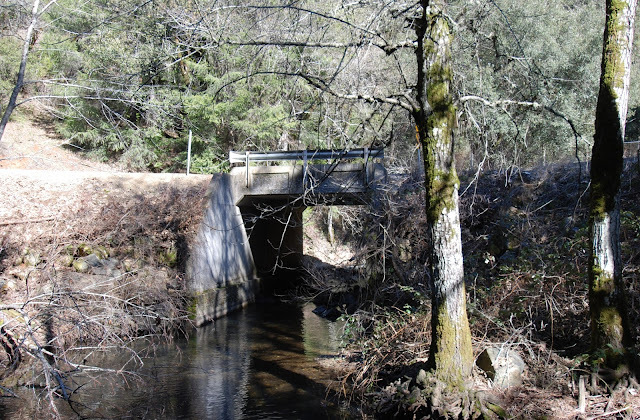 The next bridge (which is also the first bridge that crosses Weber Creek) is a 30 ft long concrete slab built in 1929 that carries Newtown Road just west of the Weber Creek Reservoir. Like the previous bridge it has nice use of formwork for the slight haunch at the abutment walls and for the recessed panels on the barrier rails. El Dorado County, California Bridges: Newtown Road Bridges across Weber Creek by Mark Yashinsky is licensed under a Creative Commons Attribution-NonCommercial-ShareAlike 3.0 United States License.